You. Me. 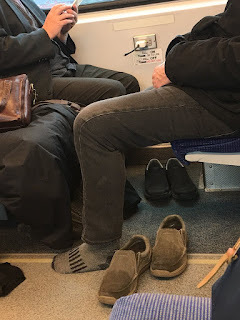 Ride This Crazy Train - Adventures and Observations on The GO: Feet feeling a little moist? Need to dry out? Sure, we all want to smell it, heck, EVERYBODY TAKE YOUR SHOES OFF! Just wait... summer's coming soon so we can start seeing all those ladies putting their bare feet all over the seats! I'll never forget the guy who removed his workboots and socks -- and then proceeded to pick between his toes, on the morning train several years ago. We actually smelled it before we saw it. :p We got up & moved (fortunately, the train wasn't too crowded so we could do that). Definitely one of the worst things I saw in 26 years of GO-training.